Flooding is a natural hazard in Ontario that can happen at any time. Floods are typically caused by melting snow, ice jams, heavy spring rains and summer thunderstorms. Flash flooding is often caused by violent, and often short duration, rain storms and usually occurs with little or no advance warning. Flooding can also occur from overflow of storm water management ponds and water main breaks. Develop an emergency plan so every member of your household knows what to do in the event of heavy rains and flooding. Make sure you have an emergency kit ready. Stay informed – be aware of extreme weather conditions and flooding possibilities. If you live in an area that is at risk for floods, elevate your furnace, water heater and electric panel to reduce the risk of water damage during a flood. Put weather protection sealant around ground-level doors and basement windows as well as window well covers to block rain water from entering. Install "check valves" in sewer traps to prevent sanitary sewage and/or stormwater from backing up into the drains of your home. Extend downspouts away from your foundation to ensure water flows away from the building. Know how to shut off gas and water valves and keep written instructions handy. Store important documents on an upper level in your home, not in the basement. Flash floods can occur in stream, drainage channels, valleys and other areas, sometimes without any warning. If there is any possibility of a flash flood, move immediately to higher ground. Don’t wait for instructions to move. Follow your emergency plan, including plans for those with special needs, children or older adults and locate your emergency kit. Move essential items, documents and keepsakes to an upper floor. Turn off utilities at the main switches or valves if instructed to do so. Disconnect electrical appliances. Don’t touch electrical equipment if you are wet or standing in water. Secure your home. If you have time, bring in outdoor furniture. Listen to the radio or use your mobile device to find out what areas are affected, what roads are safe, where to go and what to do if the local emergency officials ask you to leave your home. Don’t use your telephone, except in an extreme (life-threatening) emergency. Follow your emergency plan and take your emergency kit. Don’t walk through moving water – you may fall. If you have to walk, look for where the water is not moving and use a stick to check the ground in front of you. Be aware that flash flooding may occur. If there is any possibility of a flash flood, move immediately to higher ground. Keep children away from flood water. Stay at least 10 metres (30 feet) from downed power lines. Don’t drive into flooded areas. If floodwaters rise around your car, abandon the car and move to higher ground if you can do so safely. You and/or the vehicle can be swept away quickly. Don’t camp or park your vehicle along streams, rivers or creeks, particularly during threatening conditions. Know what to do in case of a power outage. Visit our Power Outage page for more information. Dangerous conditions can exist after the flooding ends. Stay informed – additional flooding or flash floods can sometimes occur. Stay off roads and out of the way of emergency workers. If you’ve been evacuated, return home only when instructed to do so. 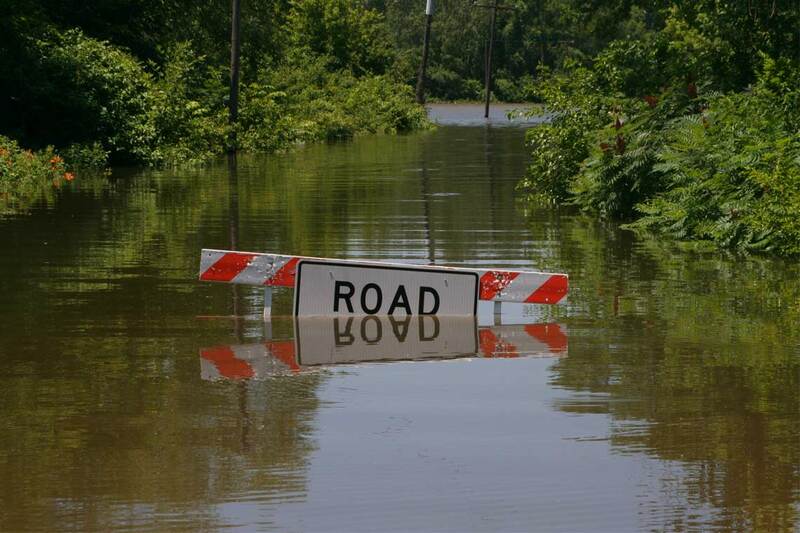 Do not drive through road barricades or on flooded roads. If you must walk or drive in areas that have been flooded stay on firm ground. Standing water may be electrically charged from underground or downed power lines. Consider the following safety tips when re-entering your home or basement. Use extreme caution; there may be hidden damage, particularly in the foundation. If you suspect that your home has suffered structural damage, leave immediately and contact a professional home inspector. If you smell gas, leave the home immediately and contact your gas company and Oakville Fire. Watch for water near electrical wires, outlets or breaker panels. Only turn on your home’s power at the main breaker switch when you are sure it is safe. Otherwise, consult a qualified electrician for a safety inspection. If any electrical appliances were affected by the flood, have them inspected by a qualified electrician. Wood, gas and electrical heating systems should be inspected by a qualified technician before use. Make sure all carbon monoxide detectors are in working order. A home that has extensive water damage or has been flooded with sewage-contaminated water may require professional cleaning. Contact your insurance company before you hire a contractor or begin the cleanup yourself. Wear protective clothing, face mask, disposable overalls, protective eyewear, gloves and rubber boots. Be aware of electrical hazards. Shut off the power to the area, if possible. Ventilate the flooded area by opening windows or using fans. Quickly remove your belongings to help prevent further water damage and mould. Properly dispose of any items that have been contaminated with sewage or things that can’t be cleaned. This includes medicines, cosmetics, and toiletries, and food products (fresh, frozen or packaged). Remove excess water using a water pump, a wet/dry vacuum, old rags and/or towels. Remove soaked and dirty building materials and debris, including wet insulation and drywall. Clean all surfaces and belongings. Wipe or scrub away dirt and debris using a solution of unscented detergent and water. Disinfect all cleaned items. Carpets and furniture that can be saved may need to be professionally cleaned. A dehumidifier will help remove excess moisture from the affected areas of your home. If you have your own well and are concerned about contamination, have the water tested before using or drinking it. For more information on drinking water safety, contact Halton Region. Refill your emergency kit and update your household emergency plan, if needed. Visit the Emergency Management Ontario website, the Federal Government's Get Prepared website, and the Halton Region website. Visit the Climate Change Adaptation Initiative page to review the Town of Oakville Climate Change Primer. Visit the Institute for Catastrophic Loss Reduction’s YouTube channel for videos on preventing basement flooding.